These may not be the most beautiful or obvious choices, but each tells a story, and gives me the opportunity to share what I was sensing behind the lens when I captured not just the color, but the moment in time. The winds blow tirelessly along the fringes of Patagonia, where locals endure a brutally cold existence. While the days are long and the light is magical, the air stays damp and the skies are more often gray. 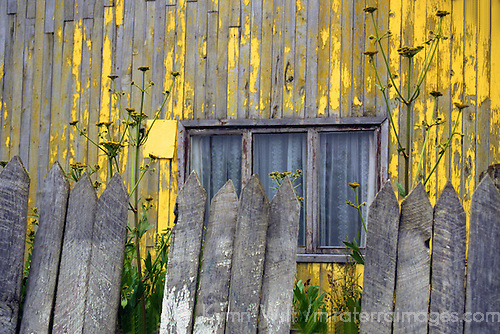 However, in the coastal town of Puerto Natales, Chile, I captured a bit of sunshine in the bright yellow paint clinging tenaciously to this weathered home. When the gong rang out indicating lunch time at Chimi Lhakhang Monastery in Bhutan, I poised my camera ready for swarms of students pouring out into the courtyard. 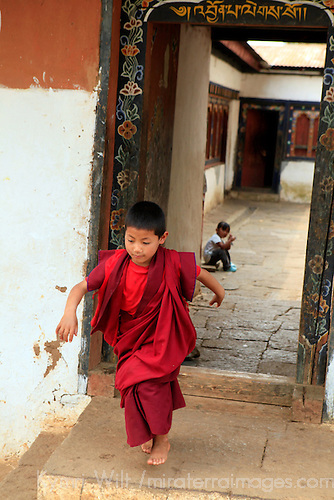 Instead I captured red in this precious moment - one young Buddhist monk was the first to skip out the door, well ahead of the others. Clearly, he'd had enough of meditating that morning! 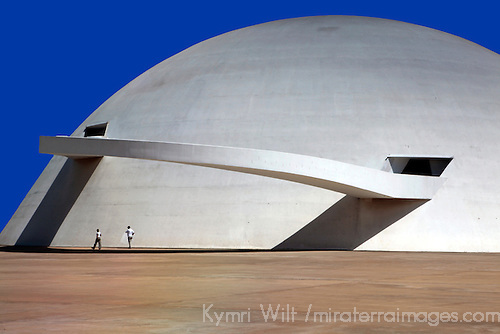 The Cultural Complex of the Republic in Brasilia in Brazil is one of many white buildings designed by architect Oscar Niemeyer, whose work is anything but ordinary...it's downright other-worldly. The sun was scorching hot in this planned city laid out smack dab in the middle of nowhere. Turning this moment into a story are two human figures walking in the shadow of the great white "planet" as it appears to set beyond the horizon. After combing through endless images of nature's green in my archives, I thought about the color green as a symbol of the environment and sustainability. I took that thought a bit further and settled on an image that tells a story of a sustainable recycling project. I was visiting the Penduka Development Cooperative in Windhoek, where job skills are taught to the under-privileged women of Namibia so that they may earn a living. 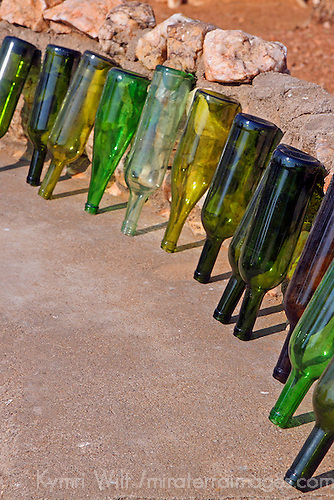 These green wine bottles drying in the sun will be recycled into glass beads from which the women make beautiful jewelry to sell. My daughter and I had just gone dog-sledding on a glacier in Alaska, and we were visiting the camp where the pups train and play. 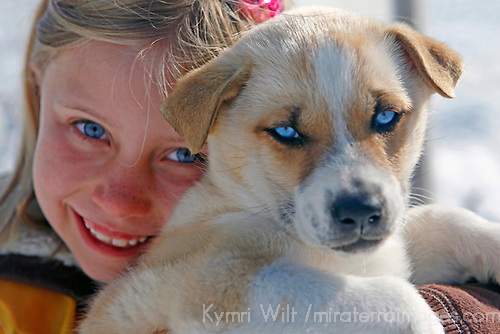 My daughter greeted every dog she could find, but when she picked up this adorable husky pup, I just had to capture the matching blue of their eyes. Finally, thanks to Vi of Travel Tips for turning me on to this contest via a comment on my recent post, Made In Morocco. Love the blue shot- so pretty! Love the last shot too! So eerie though. Reminds me of the white walkers in the Game of Thrones. What beautiful representations of these colors! The "blue" photo is my favorite, and I love the story behind the "green" one. The Brisilia shot is very cool! Great selection of photos! I especially like "yellow" - the photo and the story. I love the stories that go with each one of your colour shots! The one of your daughter with the sled dog is precious - I'd have to say that it's my favourite. I love these! None of them are obvious, but all of them fit and have great stories. Good luck. What a fabulous selection of color photos! Love them all. OK, the blue picture obviously wins for the cute factor, but I really love the red shot. Probably because I was always way ahead of everybody else when the lunch bell rang too. I think I would have trouble picking between all those lovely photos too. Your daughter is gorgeous in that photo but I like the red shot as well. I think the story that you've written for it really adds to it. LOVE the yellow and blue photos! I was always jealous of kids with blue eyes since they're so vibrant. What wonderful pictures! You certainly have a good eye for detail. Love these! Your red photo is gorgeous and I love the matching eye colour in your blue photo. They're great glimpses of colour that aren't obvious. Great job! Blue lovely eyes, red dress, yellow old wall.. every picture looks perfect. Intriguing pics. Hard to pick a favourite. Pretty great post. A very good and informative article indeed . It helps me a lot to enhance my knowledge, I really like the way the writer presented his views.